180 gram LP comes with a free download. Also available as CD or digitally via iTunes. Shipping vinyl to an American address? Order your copy through Midheaven! Lofty titles have never found much of a home on Vancouver Island, but if there’s anyone who has been around long enough to start doing some crowning, it’s Carolyn Mark. 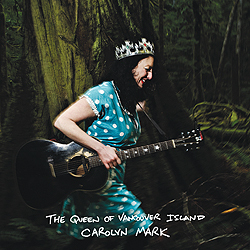 A culmination of Mark’s long-time friends and collaborators, The Queen Of Vancouver Island illustrates the West Coast chanteuse’s pivotal role in the Vancouver Island music community. It is also the name of a ferry boat that plies the Georgia Straight on a daily basis. Without reverting to terms like "illustrious", "laurels", or, god forbid, "lifetime achievement", Mark’s career has been long, winding, and admirably unfaltering. Forever looking forward, yet never too haughty to enjoy the present, the songwriting and friends who lend a hand on Queen make it impossible to refute the self-crowning with a friendly reminder that the songwriter hasn't lost her playful side.